Opting for tracks on a combine will add a hefty price tag over wheels and tyres, but for one Oxfordshire grower, the decision to replace wide boots with long belts was worth it. 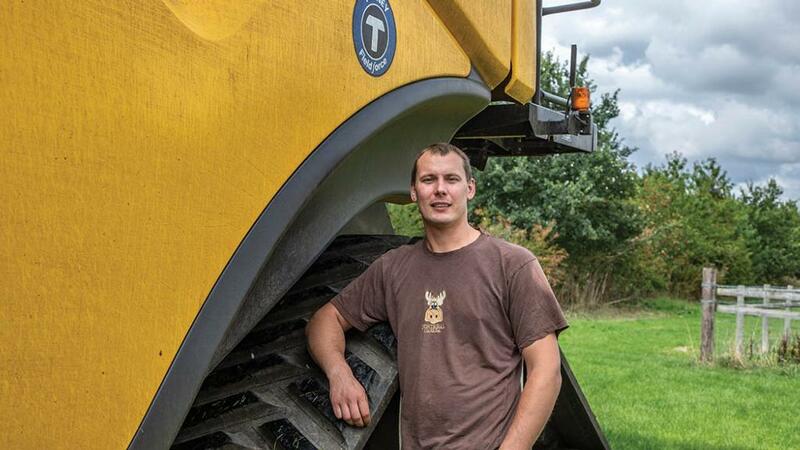 Without the simplicity of ring-fenced land around Clattercote Priory Farm, Claydon, near Banbury, A and J Taylor has to make use of local roads to access the 750 hectares it harvests each year. Logistically, field locations have posed many challenges for the farm when it comes to moving machinery between blocks of land. Along with foreman Matt Bowen, he has made a point of moving its largest machine, a New Holland CR9.80 combine, very early in the morning. 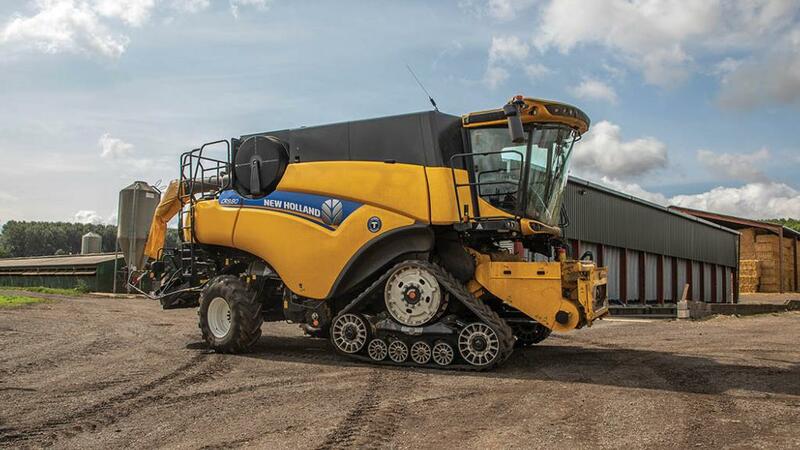 For the last two seasons, that impact has eased considerably since the farm took delivery of a New Holland CR9.80 combine shod on 600mm tracks, as Matt Bowen explains. 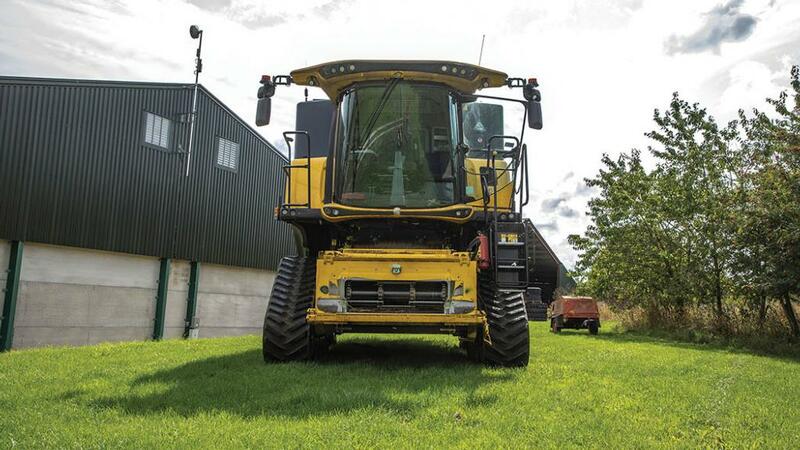 “The newer combine is so much narrower than its predecessor, that it is now much easier to thread along local roads,” he says. Prior to the tracked CR arriving at Clattercote, the farm relied on a 2010 model CR9080 shod on 900mm-wide tyres, and equipped with a slightly smaller 9.1m header. “The CR9080 was a good machine, but it was such a pain to move around the roads,” Mr Bowen adds. “We did look at a set of 1050s for it, to make the most of low ground pressure, but they were just too wide and too clumsy for our situation. The CR9.80 arrived for the start of the 2017 harvest as an ex-demo machine from local dealer PA Turney. 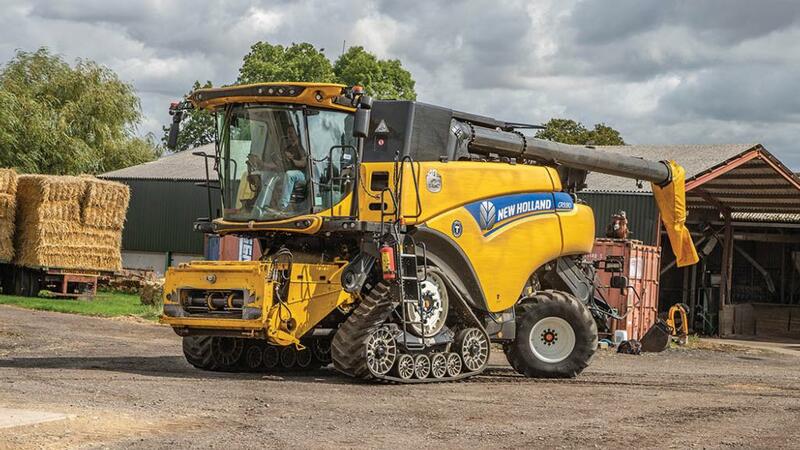 It was already equipped with New Holland’s SmarTrax system with suspension, and the deal provided an affordable route into more performance, productivity and comfort, compared to buying new. In New Holland’s case, each track assembly affords considerable movement through its two pairs of smaller idler rollers which can pivot and rotate laterally and vertically. 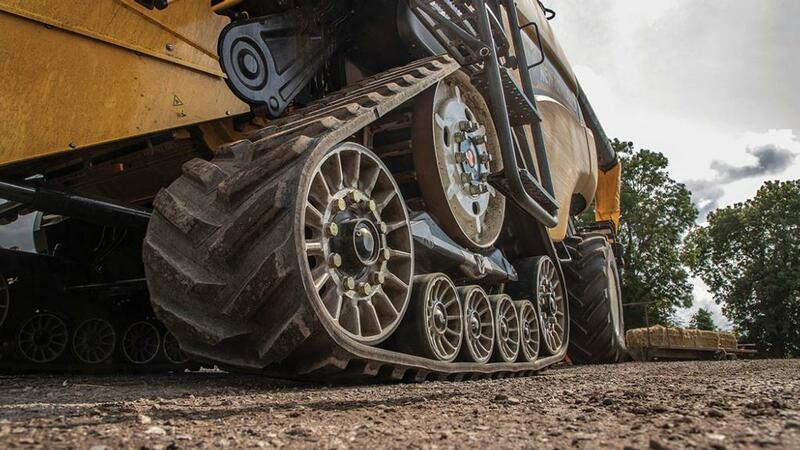 The manufacturer says such movement follows ground contours far better than a non-suspended undercarriage, and this boosts traction by keeping more of the track firmly in contact with the ground as field conditions change. Cleverly, track tension is also automatically applied each time the header is raised. 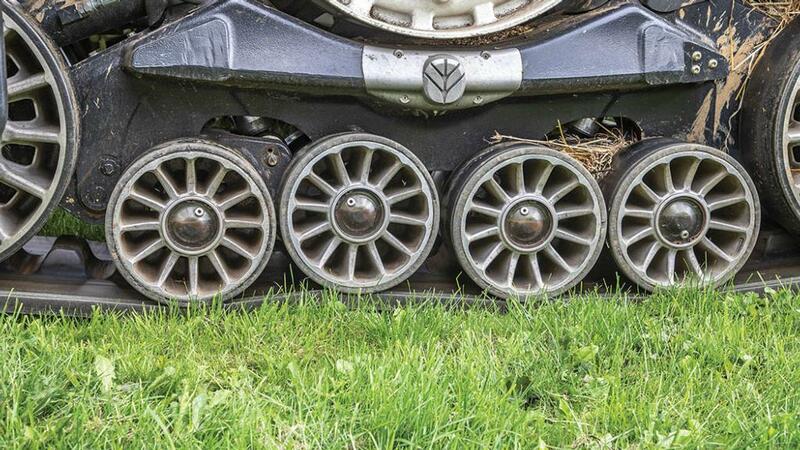 “The differences between tracks and tyres is night and day,” Mr Bowen says. “I no longer feel the tramlines when pulling in and out of headlands. “On the wheeled combine, there would always be a bounce as you manoeuvred at headlands, and stubble heights would highlight that range of movement. particularly on the steeper banks we farm. Tyre wall deflection was quite noticeable when you are sat 14ft in the air, and you just do not get that with tracks. And the longer contact patch has given us a further reduction in ground pressure compared to the 900 tyres. With 208ha at Clattercote Priory Farm, all remaining land is scattered north and south of Banbury and its surrounding villages. Though the rotation affords outlying land to be cropped in 40 hectare blocks. Fortunately, output of the CR9.80 has also been improved over its predecessor. “We can now comfortably cut 100 acres per day, and our best day has seen 137 acres go under the knife with the CR9.80,” says Mr Bowen. “The best we could ever see through the CR9080 was 90 acres in a day and the planets had to align to achieve that output. With Varifeed on the combine header, Mr Bowen says the knife’s location is rarely in its fully retracted position, and is managed in every crop to make the most of crop flow. With a focus on min-till, the farm was keen to see more consistent stubble heights, and to ensure a better chop and spread function across the wider working width. Neither have been areas for concern, and with soil structure becoming an increasingly important aspect of crop production, the farm keeps tractors and trailers on grass margins around the outside of each field, with the combine travelling to the trailers to unload. With a Vaderstad Carrier 650 and a straw rake to generate a green bridge, the farm is managing black grass with the help of a six-year rotation and the inclusion of pig slurry form its own livestock enterprise. “Worm counts have gone from just two or three in a spade full of soil, to 30-40 worms per spade full,” adds Mr Bowen. So given the stability and capability of the CR9.80, would the farm consider going wider? “If we ever did, I would like to look at a MacDon header next time,” says Mr Bowen. “The rigidity of our 35ft header does mean there are a few places across the farm where stubble heights are shaved at one end and lengthy at the other.